You say potatoes, I say no thank you. I’ve been avoiding potatoes for a while now. It initially started as an attempt to improve my digestion by avoiding heavy-starch (a.k.a sugar) that always seemed to upset my tummy after a meal that included potatoes. Then I learned about the nightshade family (more on that coming soon), but for now nightshades are a family of vegetables. The members of this family include peppers, tomatoes, eggplant, and potatoes. Nightshades contain a chemical called solanine. And solanine can cause an inflammatory response if you are sensitive to it. This inflammation can contribute to joint pain, joint swelling, and all forms of arthritis, and can also cause digestive discomfort. Not everyone who has joint pain and or swelling is sensitive to nightshades however; if you have joint pain and or swelling, you may want to consider avoiding nightshades for several weeks and see if you notice a difference. 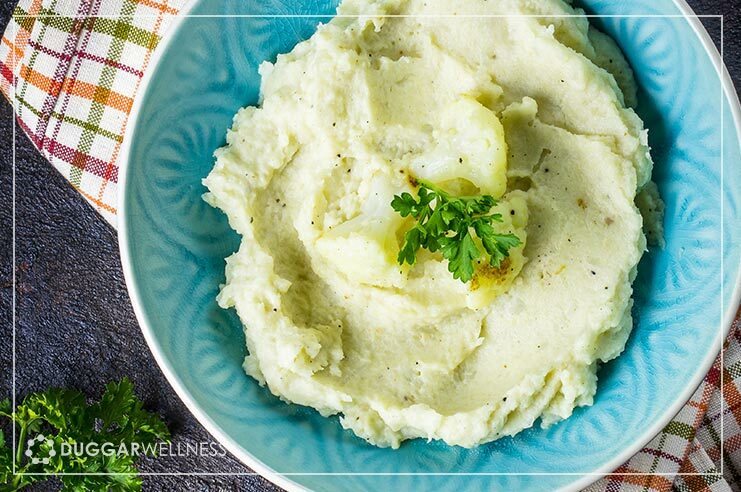 This combo of turnips and cauliflower adds new flavor to “mashed potatoes” as well as a ton of nutrients. Place the turnips and cauliflower in a steaming basket and allow to steam until very tender, about 15 minutes. Add the steamed cauliflower and turnips to a blender jar along with the oil and salt and blend until desired consistency.